I’m so excited to tell you about a fantastic TV show for kids who love trains: The Choo Choo Bob Show! I first heard about it from a Play Trains! reader over on Facebook, so I was very happy when the generous people at the show contacted me and asked if we’d like to check it out. Even better, their generosity extends to all of you, because I have three amazing prize packages to give away at the end of this post. As Choo Choo Bob would say, HOLY SMOKESTACKS! And this really is something to be excited about. The Little Engineer and I both loved it — the DVDs, the songs, the book, their website…all of it! 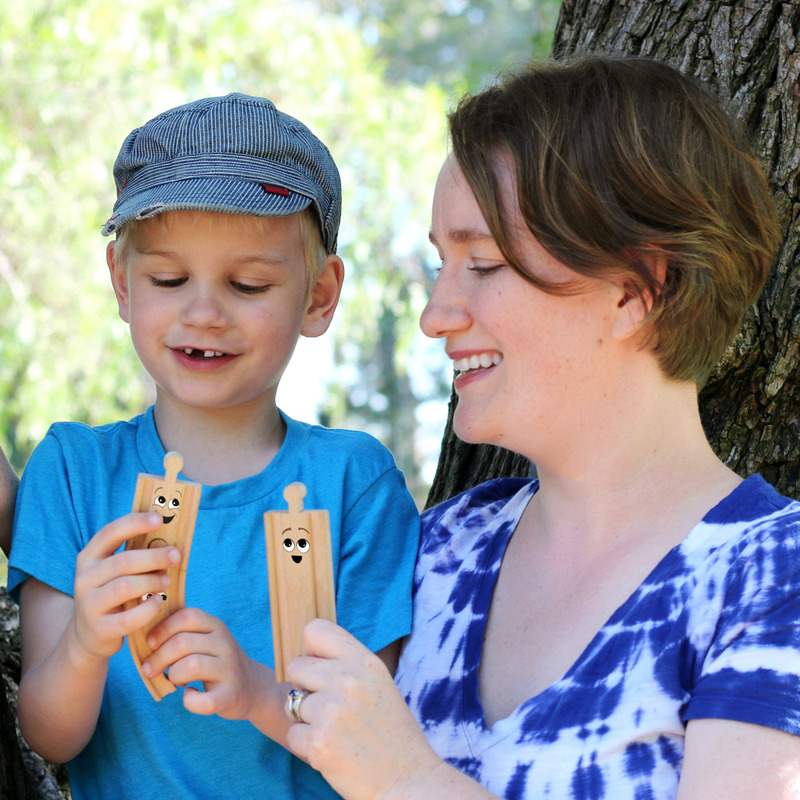 We’ve had so much fun with the show that I’ve included some of our favorite ways to play Choo Choo Bob at home. 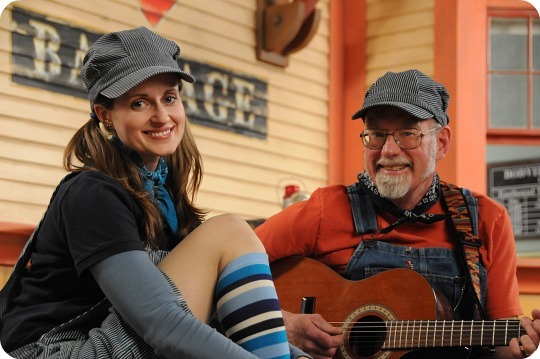 If you have a preschooler or school-age kid who loves trains — and, for once, this is a train show for preschoolers to grow into, rather than for school-age kids to grow out of — you have to watch this show with them. Read on to find out why! I received two DVDs, a CD, and a picture book from the Choo Choo Bob Show with a request for my honest thoughts on the show. All opinions are, as always, my own. The prize packages for the giveaway are also being generously provided by the show. The Choo Choo Bob Show follows Choo Choo Bob, a train enthusiast with a clubhouse right next to the train tracks in Bobville. His adventures range from riding the rails on real engines to using his Shrinkatron to shrink down to stroll the streets of Tinyland, his model train set. All the while, his trusty camera is close at hand. A cast of vivid characters joins Choo Choo Bob at the clubhouse and beyond. His dead pan best friend, Richard W. Kornbelt, has a new job every week, which he pursues with great commitment and little skill to ridiculous results. Bob has the good fortune to be friends with Engineer Emily and Engineer Paul, who take him to see all sorts of different real trains and real train stuff. Engineer Emily is a particularly welcome addition to the cast of characters: in addition to being one of the few female engineers I’ve seen in train videos and books for kids, she’s a strong, smart, and capable woman who’s always game for a train adventure. Charlie Rat and Conductor Dave have a slapstick love-hate friendship, Ticket Agent Cee Cee rattles off facts about the real trains, and Randy the Planner tries to impose order on Tinyland as a faulty Shrinkatron and its inhabitants thwart his careful plans. The show is goofy, earnest, high energy, and just plain fun. I get the sense that the people behind the show really love what they’re doing, and really believe in it, too. There’s an exuberance behind every scene that has me laughing at the corniest jokes, but there’s a lot of really clever humor in the show as well. 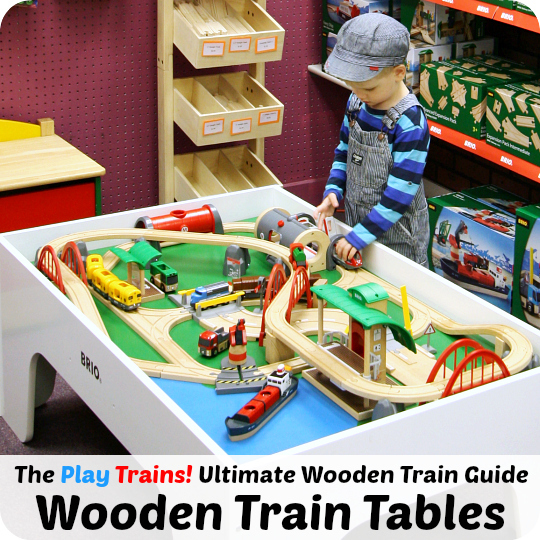 At the same time, the show encourages kids to develop a fascination with real trains, something that I think is key to keeping children interested in trains after they outgrow all the train shows, toys, and books marketed to toddlers and preschoolers. Choo Choo Bob models finding joy in hobbies that promote creative and technical skill building (photography and model trains). The scripts are packed with interesting vocabulary beyond what you’d normally see in a kid’s show, without making the stories themselves hard for younger views to understand. The show also teaches useful life lessons through the story lines, such as how to make cleaning up fun, or what a secret is and when it is and isn’t okay to keep one. The general vibe of the show is that you’re watching a very talented group of friends performing their hearts out with very high production values. This is an old-fashioned kid’s show reenergized for the current generation: entertainment that’s both wholesome and awesome. And I can’t talk about The Choo Choo Bob Show without talking about the music. The show features lots of the original train songs performed by the cast and, sometimes, with some pretty great bands that join them on screen. The songs are often catchy, and the ones that spoof musical genres from past decades make me laugh every time I watch the music videos. One of my favorites is “The People of the Plastic City”, which I have found myself singing under my breath at the grocery store while I was shopping by myself. And, unlike most kids’ songs that get stuck in my head, after I realized it I kept on singing because, hey, it’s a fun song! You have to watch the music video, because it’s hilarious. However, the song that had me doubled over with laughter was “Clean with Auto-Tune!” Along with that one, the Little Engineer’s favorites are “Dining Car Food Fight Song” and “Rat Fudge Sundae“, which is sort of funny because when we first tried to watch the show this spring, he wasn’t sure he liked it because of Charlie Rat and Conductor Dave. Just a few short months and a second try later, they’re his favorite characters to the point that he pretends to be Conductor Dave (to his stuffed meerkat’s Charlie Rat) more often than he pretends to be Choo Choo Bob! 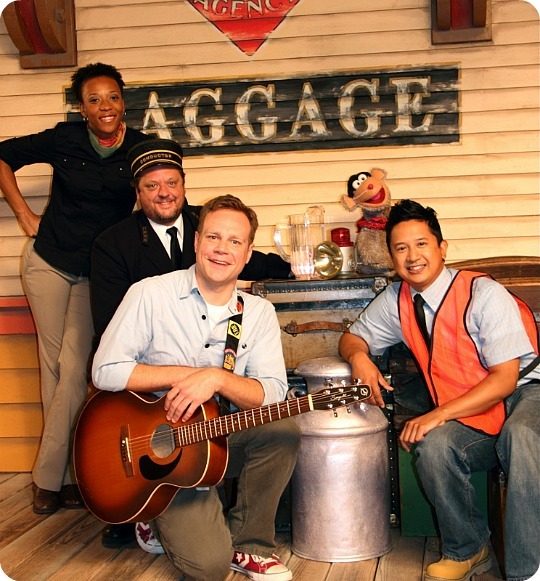 Laughter aside, Choo Choo Bob and his friends can really rock. A few of my favorites that you can watch on the Choo Choo Bob Show YouTube channel are “Brakeman Rock“, “Get Snappy“, and “Hey Streetcar“. 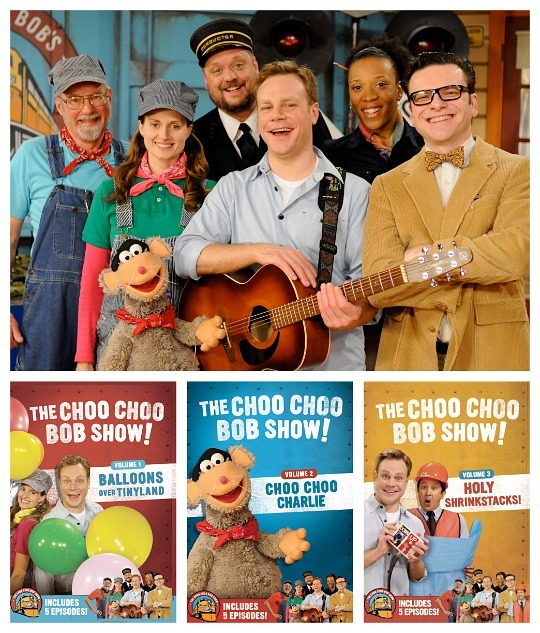 Currently, there are three Choo Choo Bob DVDs, each featuring five episodes of the show plus DVD extras (mostly music videos). In Volume 1: Balloons Over Tinyland, Choo Choo Bob and his friends visit a steam train running through the redwoods in California, go to the library to check out train books, play a crazy train game show in the clubhouse, and celebrate a balloon festival in Tinyland and Choo Choo Bob’s birthday with a surprise party. Volume 2: Choo Choo Charlie starts out with Charlie and Bob switching places to play a joke on Rich and, between other wacky adventures, follows the friends on trips to see more real railroads (including a ride on the cable cars in San Francisco) and learn about railroad tools. We haven’t watched Volume 3: Holy Shrinkstacks yet — I’ll be ordering that one for Christmas — but it includes one of our favorite episodes (“Holy Shrinkstacks“) that we’ve watched several times thanks to YouTube. 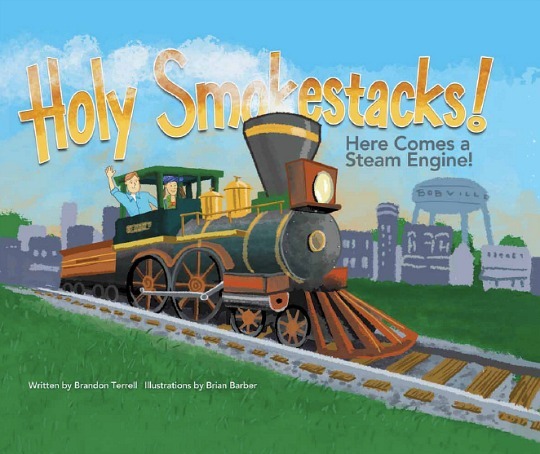 The Little Engineer loved the picture book based on the show, Holy Smokestacks! Here Comes a Steam Engine! I think he’s actually requested it more often than the show itself. The book itself reads exactly like an episode of the show, with lots of fun language and rhythm in the text and great illustrations to match. The Little Engineer especially likes the map of Bobville at the beginning and the pictures of each character on the back cover of the book. There’s one thing to know just so you’re not surprised — Engineer Emily doesn’t actually drive a steam engine in the book (they go to a railroad museum and learn about steam engines, which is great, but not quite what I expected from the cover). That aside, it’s a very enjoyable read aloud, and I appreciate how much the Little Engineer is getting out of it, judging by all the questions he asks when we read it. 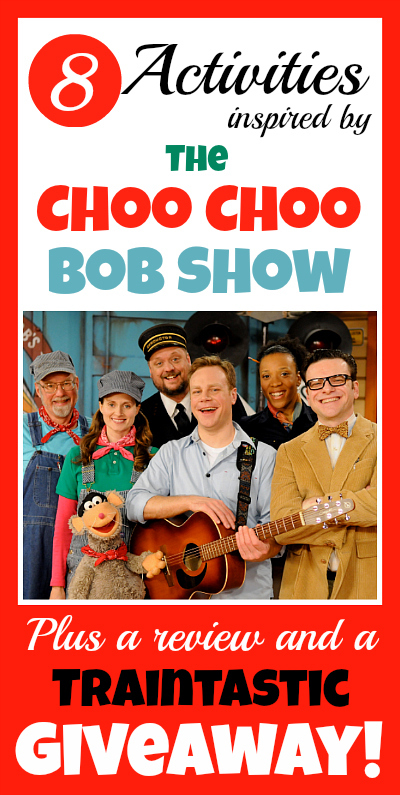 We also had the opportunity to review the Choo Choo Bob Show’s CD. It has been great to listen to (and sing along with) together in the car, because we both enjoy it more or less equally. 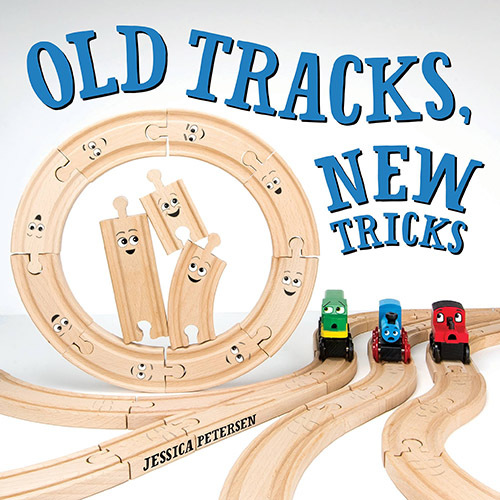 Alas, it’s out of print at the moment while they update the cover art, but I will be sure to mention it on the Play Trains! Facebook page when it’s available again. Watching The Choo Choo Bob Show really ignited the Little Engineer’s imagination, and he came up with some really fun things to do based on the show. Cleaning with Auto-Tune — I mentioned above how much we loved this music video. Singing the song and acting out the Little Engineer’s favorite part (when Choo Choo Bob “dusts” Conductor Dave) while picking up toys has made for some fun clean-up times at our house. 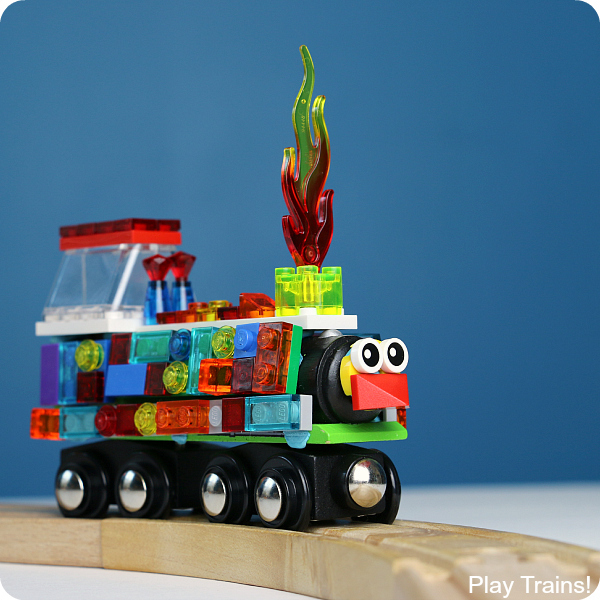 Building Tinyland — Whatever kind of toy trains you have at your house, they can be used to build your own Tinyland. I love that there are some very handmade looking additions to the train set on the show, which are great inspiration to make more DIY additions for our wooden train set. Choo Choo Bob LIVE! — While we were waiting for our DVDs to arrive, we watched a lot of Choo Choo Bob videos on their website and on YouTube. The Little Engineer was really intrigued by a video montage of the cast performing Choo Choo Bob Live. This led to him asking a lot of questions about how the show was made, and how they put on the live performances, which was a lot of fun for this former high school drama geek. After we watched the DVDs and listened to the CD a few times, he started asking to put on our own performances of Choo Choo Bob LIVE!, complete with a cast list (noting which family member or stuffed animal would play each of the parts), props, costumes, tickets, and a velvety blue blanket draped along his bed frame for a curtain. I was amazed at how many of the lines he could remember from the show. However, nothing surprised me as much as when, after asking to listen to “Brakeman Rock” in the car on repeat, he sang the first verse and the chorus from memory the next time we did a “live” performance. This is a great way to learn about theatrical and musical performances, as well as an opportunity to practice memorization and think creatively about how to make the props and costumes. We now do several “Lives” as he calls them, coming up with cast lists and figuring out props and costumes to go with his favorite books, TV shows, and movies. Build Your Own Shrinkatron — The Little Engineer has built (and rebuilt) many Shrinkatrons out of Lego, but it would also be fun to make one out of recycled materials. This has been a fun part of our version of Choo Choo Bob LIVE! Usually the Shrinkatron breaks several times (inspired by the episode, “Holy Shrinkstacks!“), and different characters have to come and help him rebuild it. Speaking of the Shrinkatron, we have had so many discussions about it, trying to understand what it does, how it works, and what might be inside it. Trap a Rat — One of his favorite parts of the picture book is the illustration of Conductor Dave and Charlie Rat playing “Trap a Rat” (a fictionalized version of the board game, Mouse Trap). The Little Engineer wanted to play it, too, so we made our own version with Duplo bricks, marble run tubes, marbles, and dominos. Playing Chess on the Orient Express — While the Little Engineer doesn’t know how to play with all the rules yet, I’ve been familiarizing him with our chess set off and on ever since he expressed interest in exploring the pieces as a toddler. One of the lines in “Rat Fudge Sundae” mentions Conductor Dave and Charlie Rat “playing checkers and chess on the Orient Express”, so now we pretend to be them when we get the chess set out. Come to think of it, we often pretend to be Choo Choo Bob characters when we’re playing train-themed board and card games. Making Up “Real” Train Names — The Little Engineer really likes the sound of the names and numbers of the real trains on the show. So sometimes we pretend we’re Ticket Agent Cee Cee and Charlie Rat and report on the names and numbers of “engines” as they pass by (usually wooden trains or cars and trucks on the road we’re pretending are trains). Play Games on their Website — The Choo Choo Bob website is really cool (click on the smokestack in the bottom left-hand corner of the site to see what I mean). 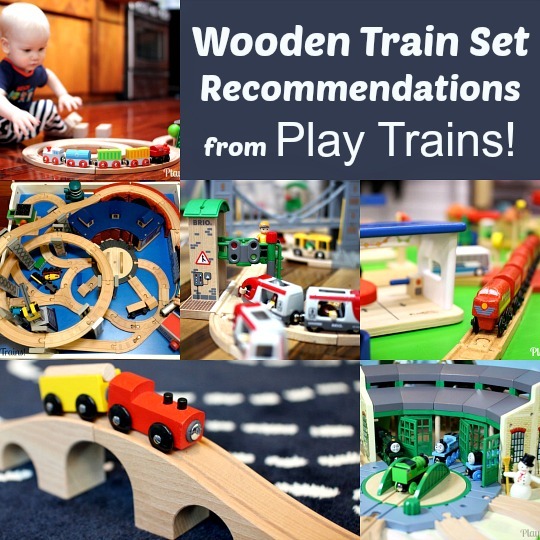 It’s a nice, safe place to watch some Choo Choo Bob videos, but they also have coloring pages for each of the characters and three great train games for kids to play. Tinyland Tracks, a track-building puzzle game, is probably our favorite. Choo Choo Tunes is a very creative mix of music composition and trains, and Choo Choo Race is a simple but exciting train racing game. 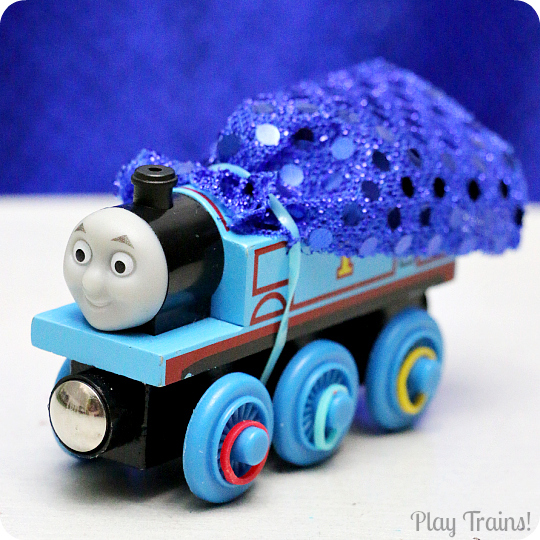 Our Choo Choo Bob Show Giveaway! To enter, visit the Choo Choo Bob Show’s website or YouTube channel and watch a few videos. Tell me about your favorite one in the comments, and then enter through the Rafflecopter widget below. The contest ends at 11:59 pm PST on Sunday, December 1st. The winners will be contacted by email within 48 hours of the close of the contest. Delivery will take up to two weeks after I have received the winners’ mailing addresses and passed them along to the Choo Choo Bob Show, which ship them directly to the winners. The giveaway is open to US residents 18 years of age and above. My son loved the engineer song on the Choo Choo Bob u tube page. So cute! My little ones liked the short trailer. I love all the activity suggestions you shared, too! My son liked the one minute song because of all the videos of the trains going by! Oh, that’s a great one, Elspeth! This is so exciting! My little train enthusiast outgrew “trains with faces” (his words) a while ago. So we’re definitely in the market to try something new. Thanks for the recommendation and the chance to win! Oh, fun! I had never heard of this before – but now I’m excited to check it out! My boys actually love watching the train spots that explain what the different trains are and the little history and info they give on them. My hubby and I are Minnesotans and were sad when we missed the state fair this year and the boys missed Choo-choo Bob. They are awesome and my guys love Choo-choo Bob and Charlie Rat. You’re welcome, Gretchen! I’m so excited to be able to offer it to all of you! I love the train spots, especially the way the information is delivered…so great for getting kids curious. We would love to see Choo Choo Bob Live. Or be able to watch the shows on TV when they air! My two boys are a little too young to completely understand all the dialogue, but they loved the musical aspect – the one minute song in particular seemed to stick. Thanks for letting us in on a great show! Glad your boys enjoyed it! I think it’s a great show for a really wide range of ages. My oldest son has been watching Choo Choo Bob for years. He loves them all so I don’t think we have a favorite. Now my youngest (20 months) has started to watch them with big brother. We love the show’s. That’s so wonderful! What a great thing for them to share. My little ones just love trains. The youtube video will be watched over and over again. Fantastic! So happy to hear it. This is so neat. I’ve never heard of Choo Choo Bob before. I thought I knew all the train stuff after having five boys who were into them. I will have to look at their site. Thanks. Cool, I’m so glad to introduce you to the show! I only have the one train-crazy kid, but you would think that after blogging about trains and kids for almost a year, I would have seen it all. But I keep finding new stuff, too! What a great giveaway! We love Choo-Choo Bob and have met him in person a few times! Haha, that should be fun! Such a great song. My daughter liked the Hey Streetcar video, she now wants to know when she can go ride on one! I would like to ride on one, too! I am so in love with this show! We enjoyed all we watched, starting with Get Snappy & the Dining Car Food Fight! Oh, two of my favorites! I just love it, too. My daughter would love these!! We watched some of the videos and the one minute song one was her favorite! Never have seen or heard of this show. The boys love trains, it would be cool to win and show them something new! It’s such a hidden treasure…which is why I wanted to help get the word out! 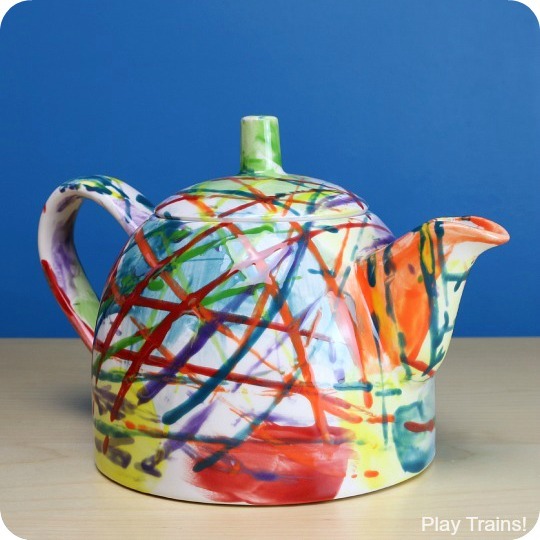 My little engineer would go Choo Choo over this! My little engineer went crazy dancing to “Breakman Rock” . Thank you for introducing us to The Choo Choo Bob Show! Gert snappy because my kids love taking pics! I love that song, and that aspect of Choo Choo Bob’s character! The One Minute song is a favorite in our house. My son loves the show and we love heading out to their store to play in St. Paul! My 7-year old loved the “Train Coming” clip, but he was fascinated with all of the ones he saw. Profiling real trains is brilliant for keeping older kids interested. He liked the “Northstar Commuter Rail” and the “Nebraska Zephyr,” especially since we’ve been through that one at the Illinois Railway Museum. The 2-year liked everything and the 5-year old girl was happy to see girls on a train show for once! Thanks for introducing this show to us. We will be enjoying it a lot. My toddler just loves trains!! She would be SO excited to get this for christmas!! I liked “St. Croix Railroad”. It was fun seeing the kids enjoy the trains. I liked the Choo Choo Race video. My little grandson would love racing these engines! My daughter and I watched the Choo Choo Charlie episode and we really liked it. My daughter can’t wait to watch more. My daughter loved choo choo bob. We like the RR Crossing safety. Great info presented in a fun way. “A Classic is a Classic” The Choo Choo Bob show! My nephew loved the plastic city song. My boys liked the one minute song they love trains. This show looks cute. My nephews would love these. I bet they would like hey streetcar the best! 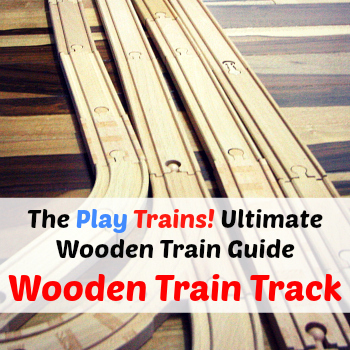 I would love to introduce this to my train loving son! Ozomatli Performs “Balloon Fest” on The Choo Choo Bob Show! I liked the Auto-tune song. Its goofy and I’m always looking for cool cleanup songs for my son and day care class! I’ve never seen this and it looks precious for the family! I like the Halloween Spooktacular the best. Also, clicking on the train smoke stack in the lower left hand corner was fun. I loved the Video and song The People of The Plastic City. Both my sons loved the one minute song! Our 3 year-old is a train fanatic!! He will love the music and videos, especially “The People of the Plastic City.” So FUN!!! I have never heard of Choo Choo Bob! It’s hard to choose a favorite, but I think I like the one about railroad safety the best. My husband is a conductor and tells me bad stories so we want to make sure our kids are informed!